By now you’ve heard about the college admissions scandal that has television celebrities such as Felicity Huffman and Lori Loughlin (and 48 other parents and college staff) facing prison time for falsifying college application information and paying bribes as high as $200,000 to $6.5 million to get students into elite and Ivy League universities. This scandal is a big deal. It’s got celebrity and other high-profile participants scrambling to hire high-priced consultants that advise the wealthy on how to navigate life in federal prison. 1. Gallup research reveals that elite and Ivy League education doesn’t actually help your kid that much. I’ve written an article here and I’ve done a 9-minute YouTube video here explaining that Gallup research on more than 29,000 college graduates of all ages reveals: Elite and Ivy League education doesn’t move the needle one bit on 5 separate measures of human thriving and happiness. 2. Former Yale professor Bill Deresiewicz urges parents to talk their kids out of applying to the Ivy League. Deresiewicz, in his book, says that the intense competition to get into an elite school can hobble a child for life. Learn 8 more reasons Bill Deresiewicz hopes your kids won’t apply to Ivy League schools in the article I’ve written here. 3. Research shows that college debt damages future human happiness to a far greater degree than does attending a lower ranked college or university. Read the important article I’ve written on this subject here and see a short video where I talk about this subject (and offer help and hope) here. Students may want to avoid state universities because they aren’t the bargains they’re all cracked up to be (as I’ve written here), and for-profit colleges are to be avoided at all costs (as I talk about here), but never fear. There are still thousands of good quality colleges and universities available that equip students for excellent careers after college graduation. 5. You can see me being interviewed on this subject by CBS News anchor Paul Mueller here. Paul interviewed me on Facebook Live after his March 18th, 2019 TV interview with me was over. The Facebook Live video is getting thousands of views, and people are saying it’s super helpful. If you’ve found valuable info in this article, please help by tweeting it out to the people who follow you. 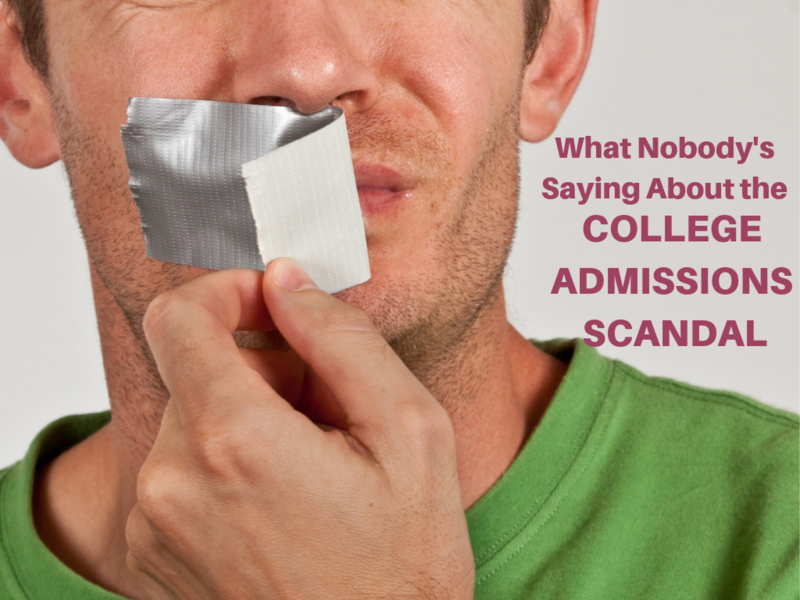 Parents are quietly asking themselves two questions about the U.S. #college #admissions #scandal. You’ll find these questions—along with reassuring answers by author and academic strategist @JBurlowski—here. You can see why financial planners and wealth managers love LAUNCH, here. You can see the top 9 questions parents are asking me about LAUNCH, here. 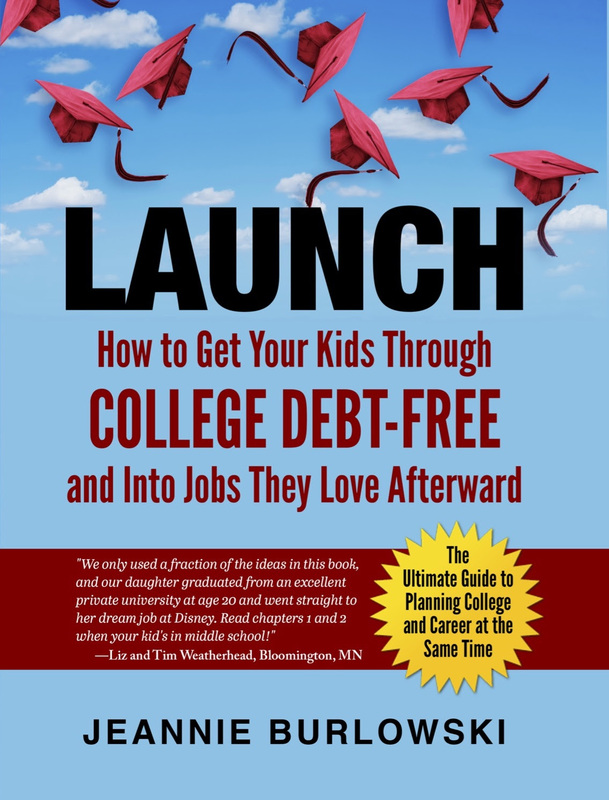 Read just one chapter of LAUNCH every 1–3 months while your child’s in middle school and high school, and you’ll know every viable strategy for debt-free college at exactly the right time to implement it. And if your child’s already well past middle school? That’s OK; you can run to catch up. But the process of getting your kids through college debt-free goes more smoothly the earlier you start it—especially if you’re not planning to save up any money to pay for college. Did you find this article through a Facebook post? Please click the LIKE or SHARE button on that Facebook post right now. You’ll be helping me get this info out to lower-income families who might never otherwise find out about it. What about you? What are your thoughts on the college admissions scandal, and on the perceived importance of elite education? Comment below or LIKE Jeannie Burlowski Author on Facebook, find this post on that page, and let’s talk about it there. Jeannie is a full-time author, academic strategist, speaker, and podcast host. Her writing, speaking, and podcasting help parents set their kids up to graduate college debt-free and move directly into careers they excel at and love. Her work has been featured in publications such as The Huffington Post, USA Today, NerdWallet, and US News and World Report, and on CBS News. Jeannie also helps students apply to law, medical, business, and grad school at her website GetIntoMedSchool.com. You can follow her on Twitter @JBurlowski.